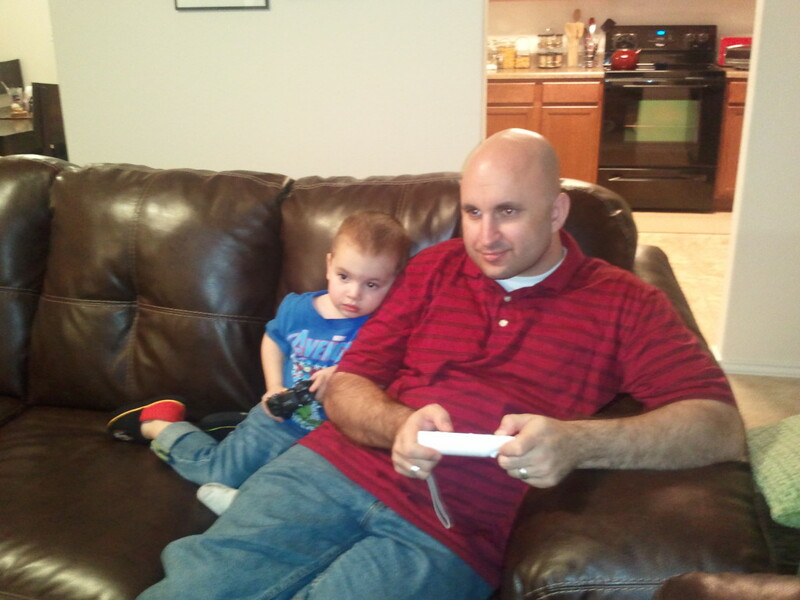 We spent the week getting back to our everyday life: grocery shopping, playing, music playtime, relaxing. 🙂 I must say that there is a low feeling immediately following a vacation. Joseph would ask every once in a while when we would get in the car (especially if it was a trip after dark) if we were going to see his cousins. The first time, I had to hold tears back as I told him no. We all had SUCH a good time on vacation. We’re really looking forward to the next time we can do it. 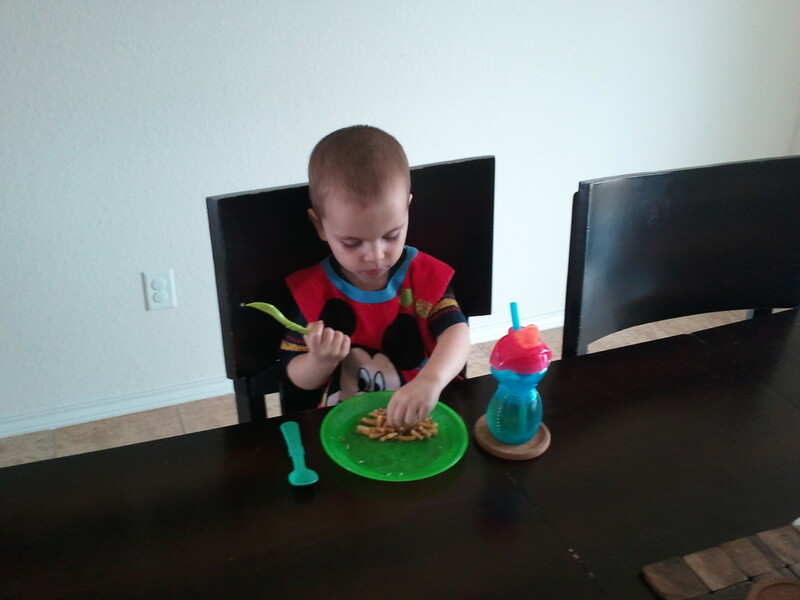 We recently moved Joseph’s booster chair off of the dining room chair that it was on and onto a folding chair, because the dining room chair made him sit too high (we couldn’t get his legs under the table) which was making it uncomfortable for him, as well as making each meal time way messier than needed since we weren’t able to get him closer to the table. 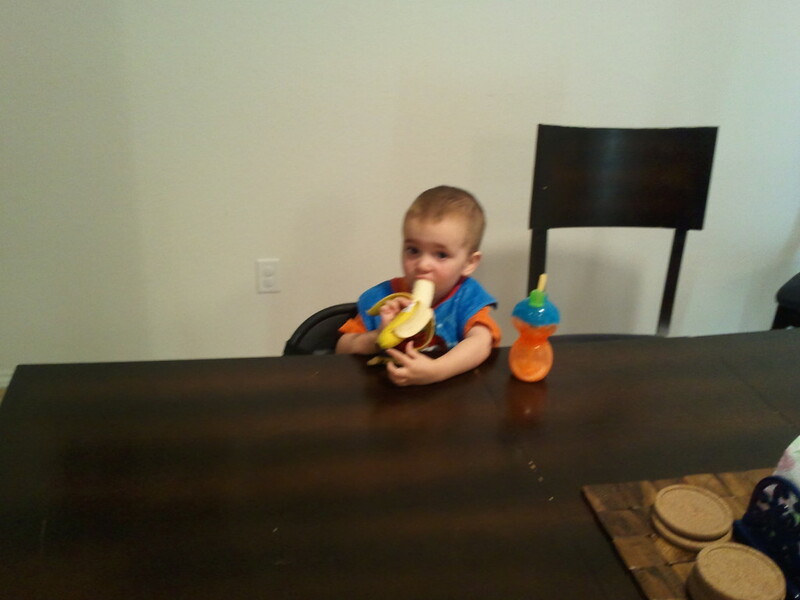 One afternoon/early evening, I was relaxing on the couch but could hear Joseph puttering around in the dining room. I heard him moving the folding chair, and then…silence. Anyone with a toddler knows that silence is anything BUT golden. I looked over the couch and discovered that not only had he climbed up into his booster chair (apparently the folding chair is low enough for him to get a foot-hold), but he had put on his bib as well. He then asked me for dinner. 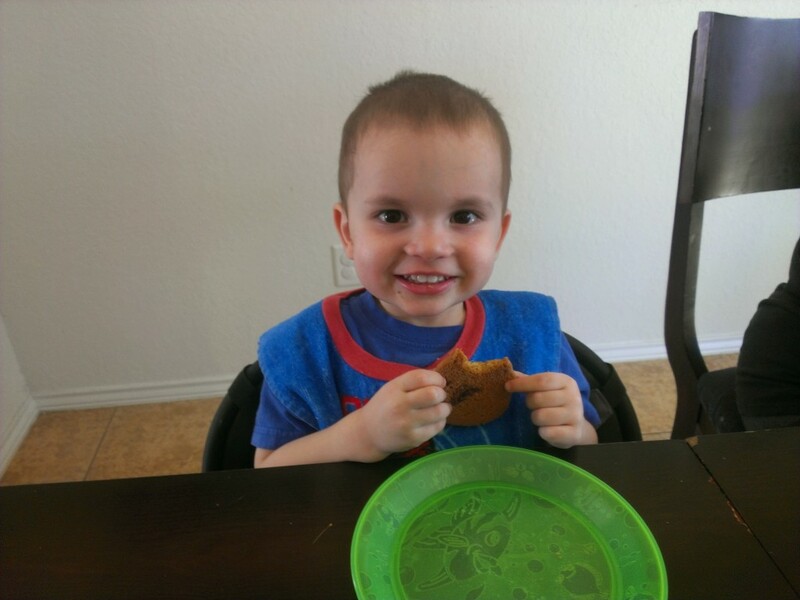 When I told him dinner wasn’t ready yet, he got pretty sad, so I caved and gave him a snack (after strapping him into his seat, of course). Devouring his cheeseburger macaroni. I think he had three platefuls in one sitting. We’re all loving the fact that he can have cheese now. 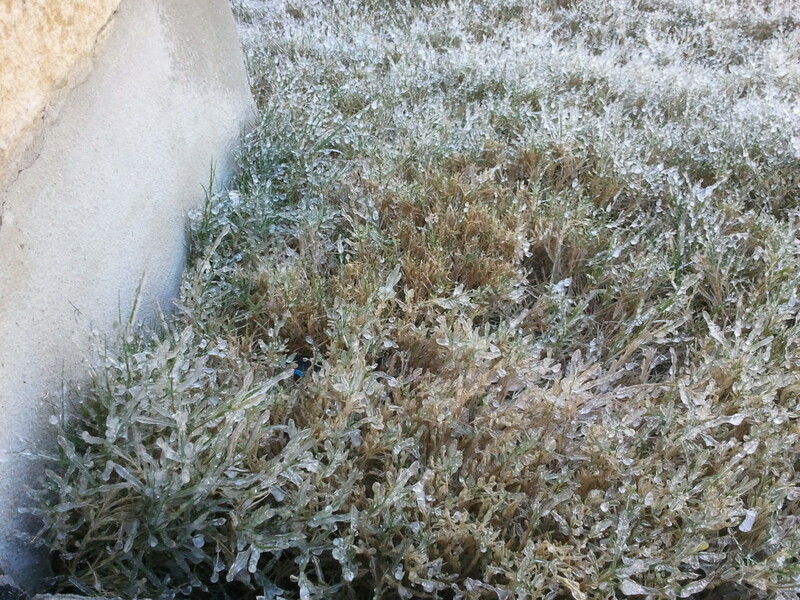 I forgot to mention that it got pretty cold the first half of the week…our lows were well below freezing. 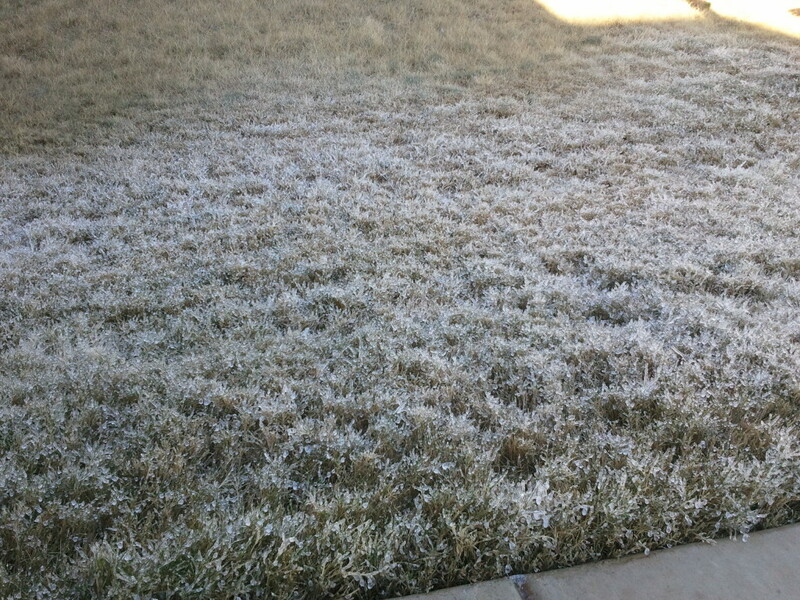 I forgot to turn off the sprinklers and they came on overnight…the water froze on the grass. I made cookies yesterday. Joseph is not a huge sweets fan, but for some reason, he sure was in the mood for one. 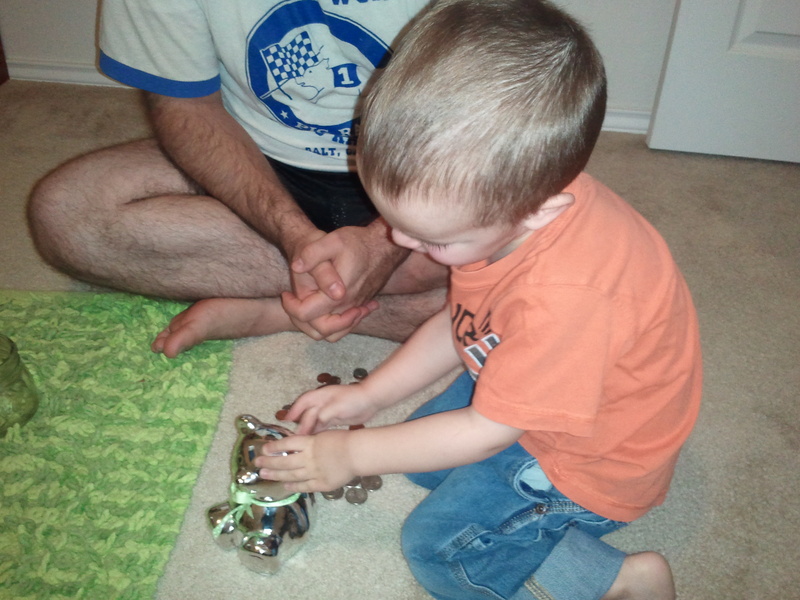 We had some spare change hanging around, so Paul decided to let Joseph put it in his bank (a bear that we got way back as a baby shower gift from one of our coworkers in CA). 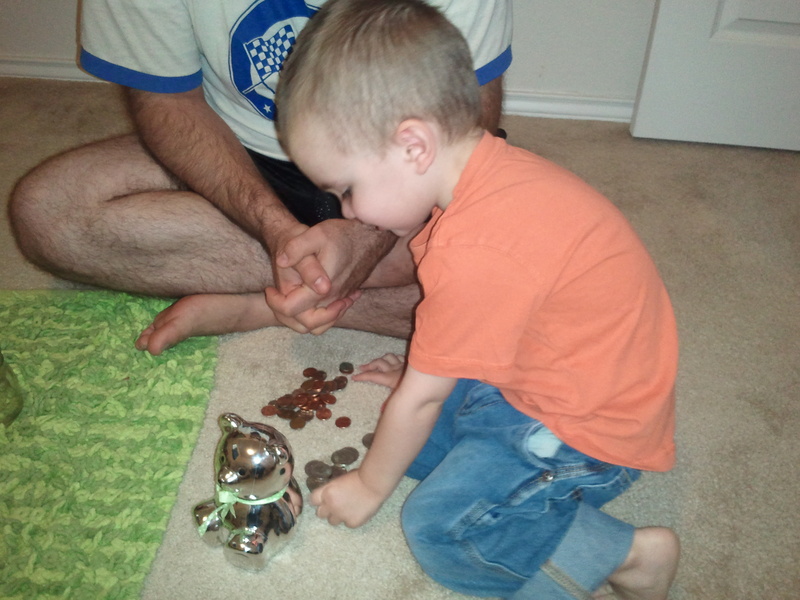 We decided that when the bank is full, he can spend the money inside on a new toy (though he keeps wanting to empty it out and put the money back in, hahaha). 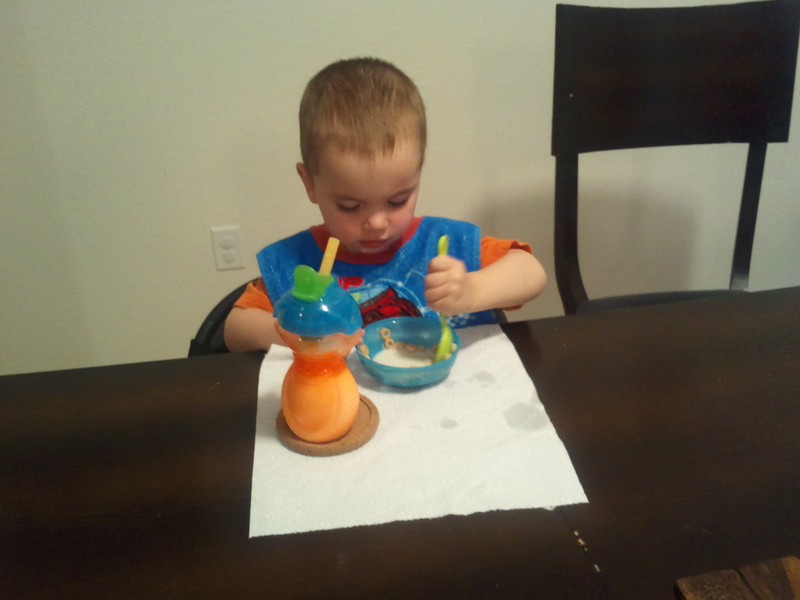 He insisted on Cheerios with milk this morning. He ate two bowls full. Followed up by half a banana.